Traditionally English pilgrims (when England was still Catholic) or other northern European pilgrims (ditto) sailed to the ports of El Ferrol or La Coruña and journeyed south from those points on what we now call the Camino Inglés (English Route). It’s a north-south route straight into Santiago without coinciding with the French route. Nowadays the Camino Inglés is a lot less travelled than the other historical routes like the French, Portuguese or coastal routes. If you’ve done other Camino routes, or have not (yet) but want a shorter or less travelled option the Camino Inglés is a good choice. Guidebook: John Brierley’s book on Sarria – Santiago – Finisterre, including the Muxia circuit and the Camino Inglés. Route: Ferrol – Santiago, about 123 kilometers. Another branch starts in La Coruña, about 76 kilometers so does not qualify for the Compostela certificate (if that is important for you), though La Coruña is a nicer city than Ferrol. What’s good and less good: I really liked the mixture of sea and mountains first three days, then the transition to countryside. Lots of varied forests, including chestnut trees at a low altitude. Less good: walking Ferrol – Fene (about 20 kilometers) has a fair amount of industry (old shipyards) and warehouses. Part of that is unavoidable but I can’t help wondering if they could have routed around instead of through some of the warehouse areas. Usual stages and other ideas: Brierley’s suggested six stages are probably the best for distances and infrastucture: Ferrol – Neda (15.5k), Neda – Pontedeume (16k), Pontedeume – Betanzos (20.7k), Betanzos – Hospital de Bruma 28.4k, big hill), Hospital de Bruma – Sigüeiro (25.2k), Sigüeiro – Santiago (17.2k), all distances as per Brierley. I did it in five stages (Ferrol – Pontedeume first day), and it’s also possible to break Betanzos – Hospital just short of the halfway point. Important note: route changes in near future: if you are planning to do this route soon: some routing changes are planned and will be marked this fall, so be aware that current guidebooks will not be 100% accurate. New route will hit all the major towns and many of the smaller ones; in some places changes will be minor and in other places more important (one local woman says the new route from their town into Sigüeiro is much better than current route). At least one change has already been made: shortly before Hospital de Bruma (well after Casa Julia): the official signage seems to disappear, replaced by handmade yellow arrows nailed to trees and newly painted arrows with slightly different color of yellow. Fear not, the apparent improvisation is the real route (for now) and re-connects with official signage. Signage: Better than expected but not perfect. There are lots of crossroads and you have to watch carefully, sometimes signage is there but not immediately visible from your angle or covered by vegetation. Lots of arrows painted on the asphalt. Going through industrial / warehouse areas can be tricky, especially just outside Santiago, where there is almost no signage (basic idea for Santiago warehouse area: after turning left into warehouse area stay straight ahead through two rotundas, walking on left side of the road, warehouses are on the right side of the road. Signage reappears shortly after last warehouses). Infrastructure: Fewer supermarkets, albergues, pensiones, hotels, bars than on the Camino Francés, Camino Norte or Camino to Finisterre. Not a deal-breaker, but you do need to be more aware of your supply places. Places to sleep: Most of these places are listed in Brierley book. Ferrol: I stayed at Hostal La Frontera, good location but a little minimalist and bar doesn’t open until 8am. Nearby Hostal Zahara (not in Brierley) looks nicer and bar opens at 6am for breakfast (excellent tomato toast). Camino friends recommended La Almendra. Pontedeume: I stayed at Hostal Norte and wouldn’t repeat, no elevator, very minimalist, bar opens at 8.30am. Nicest hotel Eumesa is at a very busy intersection, Pension Luis is well located but looks very small. My pick here would for a repeat visit probably be Hostal Allegue. 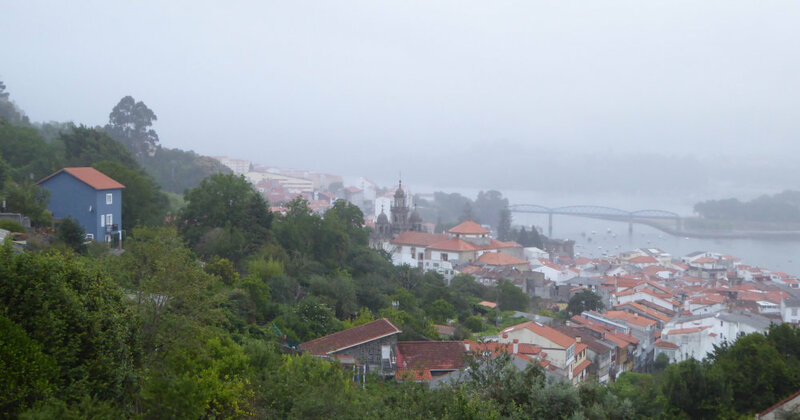 Betanzos: I had a reservation at Posada Cheiño, but switched to Hospedaje Betanzos, where a little more money got me a huge room with bathroom (other place didn’t have bathroom) and access to a full kitchen. Camino friends say the municipal albergue here is excellent. Hospital de Bruma: I stayed two kilometers up the hill at Hotel Canaima (Alto do Viento), nice room with full bathtub to soak your weary body after long day and big uphill – though neither dinner nor breakfast at the hotel was memorable, and price was a little high. Almost right across the highway from the hotel: Pension o Meson Novo, less expensive though no idea on what it’s like (you do not have to return to the albergue to continue the Camino, there’s a paved road that does a diagonal to join the Camino several kilometers beyond the albergue). Same Camino friend who recommended Betanzos albergue says the Hospital de Bruma albergue is very good, but there are only 22 spaces so the hotel / pension are good to know about. Sigüeiro: Stayed at Sigüeiro hostal and really liked it, this was my favorite accommodation on this trip. New with modern design, nice bed and interesting bathroom setup (shower and toilet in one space, sink outside in the room, much more efficient for sharing a room), very good dinner and good breakfast. Places to eat / have coffee: Surprisingly, I did not see any “menu del día” deals. This fixed price menu idea is all over Spain, not just on the Camino, and not seeing any at all was strange. That has price implications, since the fixed price menu is usually a much better deal than ordering off the menu, so you will need to pick and choose both your places and what you eat. Places to stop on the trail: The Brierley book is pretty accurate though not 100%, due to scarcity of stopping places it’s good to plan ahead to be sure you have water and food. Places I stopped showing my stage breakdown, either memorable or not in Brierley or not well described in Brierley, other bars exist most days: Day 1: Neda-Santa Maria, no bar at Neda pedestrian bridge by the albergue, continue another 15 minutes to find a bar just beyond Santa Maria church (not in Brierley), Vilar de Colo bar is in the warehouse area, not in the town. Day 2: Miño: bar Green (memorable), turn right down short flight of stairs when you see the basketball court-square, bar is under arcades on left side of the square. He gave me a chunk of homemade poundcake (bizcocho) and slices of melon and watermelon for free, plus some tourism pamphlets (supermarket in same square). Day 3 ( Killer Day Betanzos – Hospital de Bruma): Only two bars on a long and challenging day, first in Presedo, Xente do Camiño (memorable) which is well after the sign for the local albergue, good place with food and big outdoor sitting area and second in Vilacoba, Casa Julia which is small place right on the highway, easy to walk past but a stop is highly recommended since (for now) this is last stop before Hospital de Bruma. Casa Julia is also the place they count pilgrims, see below, if you speak Spanish chat with the young man. He was making filloas (local version of crepes) when I went by on a Sunday, handing them out to all customers. Day 4: Centro/Calle, bar Cruceiro, friendly with good potato omelette, empanada and poundcake, a classic Camino stop. Day 5: Hotel Castro (not in Brierley), about 2-2.5 hours from Sigüeiro. Places in towns (mostly dinners), I ate at these places: Ferrol: bar-restaurant near main square, right in front of Pescaderia fish market, excellent seafood, big outdoor sitting area. Pontedeume and Betanzos both dinner spots were forgettable, both towns have a lot of options. Breakfasts in those towns: Pontedeume, Café Martinho is right in front of the bridge, opens 6am. Betanzos, Churreria-cafeteria just to the left of calle Rollo (Camino street), near though not on calle Venezuela, opens 6.30am except Sundays when 7am or in fiestas when 8am. Hospital de Bruma, there’s a restaurant right by the albergue that my Camino friend likes, I didn’t stop since I was going on to the hotel, where dinner was forgettable. Sigüeiro: cruised town and did not find many options, perhaps because of Monday closings, ended back and Sigüeiro hostel and had a yummy dinner of mushrooms and potatoes, good food at a good price AND they have a secret back terrace that you do not see from the front, very good choice for dinner. Beaches: Weather was not cooperating during my walk so I didn’t even dabble my toes in the sea but here are my observations: several beaches on the way out of Ferrol, excellent La Magdalena beach in Cabanas just before Pontedeume, and just after Miño near Ponte do Porco. Fiesta Betanzos: My trip coincided with the Medieval Market in the medieval town of Betanzos. Market was cute and had nice things – but backpacking you have to think at least twice before buying anything. If you are planning for the future and want to see this or avoid it (town was packed to the rafters), check the dates: it’s probably the second weekend in July. People on the trail: This route is a lot less travelled than other routes – my “bubble” (people more or less in same space on same day) was about 25-30 people. The young man in Casa Julia (see above) says he counts pilgrims and that day (a Sunday) he had seen 21 so far – he counted 2000 pilgrims last August (about that many daily arrive in Santiago early July). Obviously 25 people a day is not a lot – but several albergues are about that size so good to plan accordingly and know your options. Going alone? I saw two other women walking alone, and two other Italian women who were sort of together and sort of not together. I felt completely safe, but it must be said that women alone are still a little unusual here so if you are a woman and go alone you might get some comments (like I did). For that reason, if you have never walked alone and are feeling a little uneasy about it, perhaps a more-travelled route would be better for a first solo experience.